We’ve partnered with them again to give away a bundle to 3 lucky readers of SpyreStudios. All the products included in this pack were created by Designious.com and WPwizz.com. To enter the giveaway simply leave a comment on this post (with your real name and a valid email address) and tell us why you would like to win this bundle. You can also tweet about the giveaway, we will be tracking tweets using Disqus Reactions. We will pick 3 winners using a random number generator. The contest ends on Monday, March 21st, 2011 at midnight (0:00) GMT. Winner will be announced shortly after. If you do not win, make sure you still get your hands on this design bundle before it’s too late – it’s not everyday you can get over $700 worth of design resources for $29! Would love the bundle. Tons of great stuff in it!!! Wow, what a sweet deal! Who couldn’t use all those resources in their design life? Plus, add-ons for PS & Ai always make life a little grander. Nice package. Just opening a company next month, and this would be nice for my startup. i would win the wordopress theme! Looks good would make good use of this ! First of all I wanna say this is a great giveaway by Designious, thanks for the possibility to win this nice stuff! I always get happy with some good vector packs, but I love PSD-brushes and WP Theme’s too ;-P – So, good luck everybody! 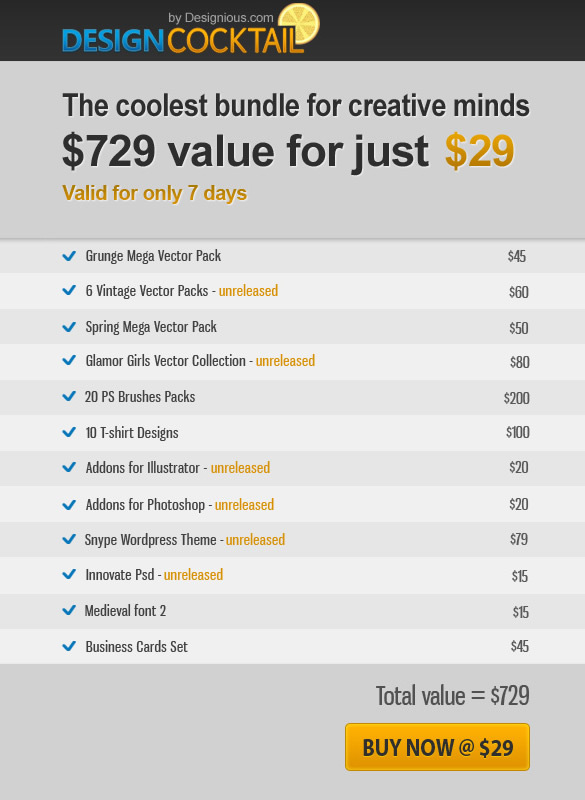 Great bundle with lots of good resources. save $700 for those gorgeous resources. ! I like !! I’d like to win this bundle because I am an amateur at PhotoShop and would love to have the resources for me to commit to learning PhotoShop properly. It’s simply a great giveaway and it would be great to win. Vector packs, PSD brushes, Illustrator and Photoshop add ons, font + wp theme – no way I can resist to this giveaway! I would like to win this bundle ’cause I got yesterday my new fulltime graphic designer job and I will surely need this! interesting bundle, will help me fo next project, thanks! Lately I’ve been working on amassing a great collection of resources for my design work. This would be a huge step in the right direction. Great bundle with lots of good resources. Count me in. I enter thousands of comps like this, never won one yet. Is that a good enough reason? I love anything that improves and speeds up my workflow! WooHoo! Count me in. I want to be awesome, this will aid me in my quest for awesomeness. Its awesome giveaway. As a freelance graphic design who has her hands full with design projects, this would serve as a great tool in helping me juggle.